The Wills Lifestyle Grand Finale by Namrata Joshipura inspired by the next revolution in human science concluded the Autumn Winter edition of Asia’s premiere fashion and trade event Wills Lifestyle India Fashion Week in New Delhi at Pragati Maidan . 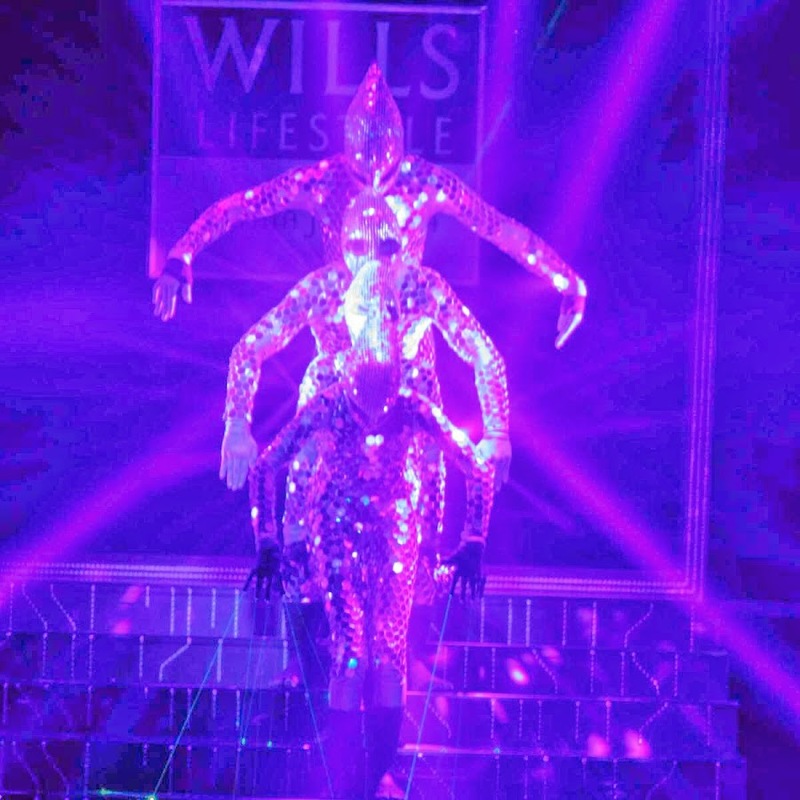 ITC’s premium lifestyle brand Wills Lifestyle marked its successful collaboration with the acclaimed designer by presenting a spectacular Grand Finale. A striking amalgamation of futuristic designs and a dramatic show, the Finale impressed the audience with fascinating elements of grandeur. The Grand Finale opened with a high-octane light driven show making quite an impression. The set up was dramatic with a LED lit ramp, creating a special experience for the audience. Kick starting the show was an impressive live music presentation that gave way to models sashaying down in striking avant-garde designs rooted in bold, and sensational silhouettes. I got a chance to see the set up, which was quite predictable and we all guessed the finale to be a show of lights,but what we did not know was the dance performance by artists in reflective suits that were engineered to befit the theme of the collection, and was also the main highlight of her show. L- The designer herself-Namrata Joshipura and R-Kangana Ranaut wearing a trail off shoulder Red carpet gown with a sci-fi inspired make up(from Mac) and metallic tipped lips. Mohawk Inspired hairdo pulls off all over space age silver and was a total dazzler. I Even Loved the sculpted hairdos, which seemed to be marrying the space age interpretation of every garment . Very Outlandish Must say. A non-profit organization, Fashion Design Council of India (FDCI), is the apex body of fashion design in India, represented by over 350 members. Founded on the premise of promoting, nurturing and representing the best offashion design talent in the country; its prime objective is to propagate the business of fashion.